T-Mobile recently told a local shop owner to shut off the go-go music that he's been playing for 25 years on the block, reportedly because someone who moved into a new luxury apartment building threatened to sue. For almost 25 years, the Metro PCS store at 7th Street and Florida Avenue NW in D.C.’s Shaw neighborhood has played go-go music on outdoor speakers. But corporate owner T-Mobile recently told the local shop owner to shut the tunes off, reportedly because someone who moved into a new luxury apartment building threatened to sue. Now more than 50,000 people have signed a petition asking T-Mobile to bring back the music. Supporters are spreading the word on social media using the hashtag #DontMuteDC. On Monday, D.C. councilwoman Brianne Nadeau, who represents Shaw and the U Street area, sent a letter to T-Mobile’s senior vice president of government affairs, urging company leaders to change their decision. 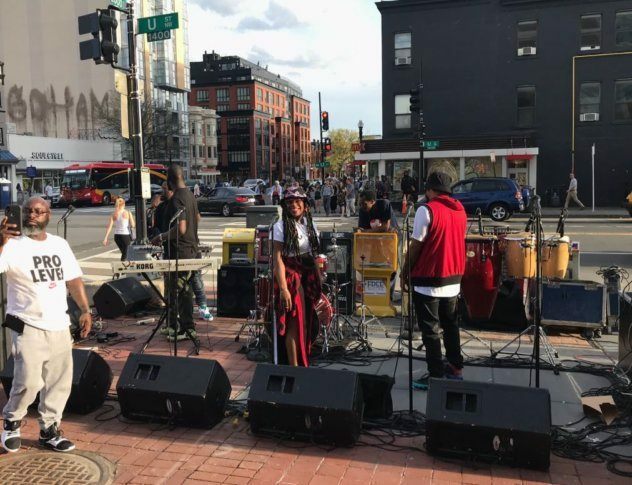 Tuesday night, a musical protest was held outside the Reeves Center at 14th and U streets NW, a short distance from the store. Go-go bands played, fans danced, and rapper and D.C. native Wale made an appearance. Councilman Robert White was there, too. “When you move to a neighborhood, you’ve got to appreciate the culture of that neighborhood, the sound of that neighborhood. It is not OK to jump into a neighborhood and then seek to change it,” said White, who is hoping for a compromise with T-Mobile. “We can work together to address that, but what we can’t do is allow folks to try to take away the sound that makes D.C., D.C.,” he said.